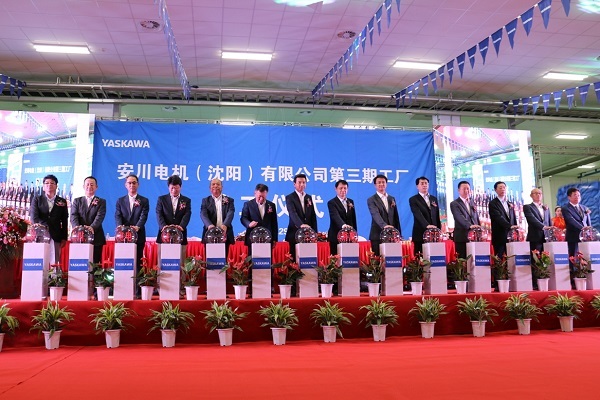 Yaskawa Electric Corporation (head office: Kitakyushu, Japan; Representative Director and President: Hiroshi Ogasawara) is pleased to announce that a completion ceremony was held on June 29, 2018 of the third plant at Yaskawa Electric (Shenyang) Co., Ltd. (Economic and Technological Development Area, Shenyang, China) and started the operation. Investments in factory automation and installation of robots are accelerating due to advancement of industrial structure, decrease in the labor force, soaring labor costs, etc. and a demand for machine tools, manufacturing equipment, industrial robots and so on is expanding in China. In addition, due to the need to rollout products to meet the needs of the Chinese market, local product development is already under way. As demand for servo motors, servo amplifiers and robot controllers, which are the main components of automation equipment, is expected to further increase in the future, Yaskawa Electric has expanded the third plant to strengthen production capacity. In this third plant, Yaskawa Electic introduces the latest production management system with the concept of “visualization”, realizing real time management of production status. By introducing this system, it will establish a system that can share global production data in collaboration with mother plant in Iruma, Saitama, Japan. In addition, in the development organization, Yaskawa Electric will combine the development functions which is currently situated at two areas in the facility to the 3rd plant to promote improvement of development capability and efficiency. Yaskawa Electric will accelerate product development to respond timely to customer needs. Guests from government officials including Deputy Mayor of Shenyang City attended the completion ceremony, and the company explained the aim of China production of servo motors and servo amplifiers as well as the outline of the new plant.